Launched in January 2012 this Christian group aims to make the streets of Leeds a safer place to be on a night out. Their volunteers work on Friday and occasional Saturday nights helping people to stay safe and working with others to reduce crime. Based at Holy Trinity Church, Boar Lane, these volunteers work alongside other agencies in the provision of practical care and ‘listening ears’. 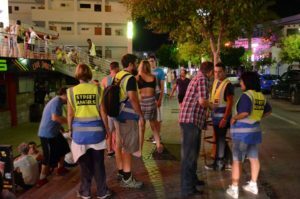 Street Angels Leeds is a Christian project with an ethos of care, compassion and practical help for whoever may need it in the night – time economy. Many of our volunteers come from local churches, though as long as the ethos is respected, volunteers may come from any faith or non-faith background. 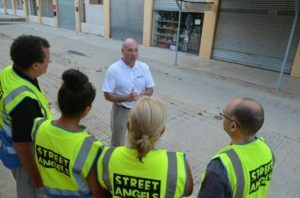 We are part of a national network of Street Angels. The first team started in Halifax in 2005 and there are now more than 100 teams across the UK. We started patrolling fortnightly, and as the team grew we now maintain a weekly patrol every Friday night. We are often asked to attend large city – wide events such as the opening of the Leeds Arena, and the Gay Pride festival to add our support alongside other agencies. The project is overseen by the Church of England, and works in close partnership with other organisations that promote safety and welfare across the city centre. We are also a local branch of CNI (Christian Nightlife Intiatives) Network.